TUCSON – Douglas Station Border Patrol agents seized more than $1 million worth of marijuana during two incidents. Agents were alerted to a possible vehicle incursion east of Douglas along the international boundary shortly after 7 p.m. Camera operators identified a Chevy Silverado truck driving north from the area, agents immediately responded and attempted to stop the vehicle. Instead, the driver failed to yield and a pursuit ensued. During the pursuit, the driver attempted to flee back to the border. Other agents successfully deployed a controlled tire-deflation device in the truck’s path. After the vehicle stopped the driver and passenger fled into Mexico on foot. Inside the truck, agents found more than 1,800 pounds of marijuana valued in excess of $900,000. 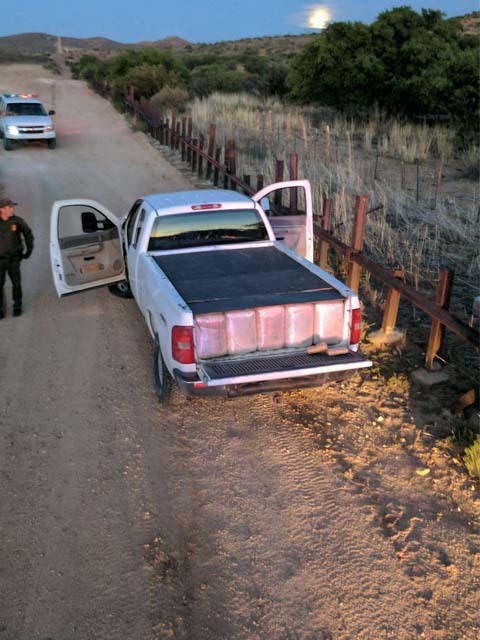 Earlier in the day, two agents initiated an immigration stop on a 2005 Nissan pick-up truck traveling east on State Route 80, near mile marker 385. The vehicle stopped but, as agents approached the vehicle, the driver sped off. Agents pursued the truck a short distance until it veered off the highway and collided with a tree. The driver, later identified as a male Mexican national, fled on foot but was soon apprehended. Agents found more than 240 pounds of marijuana, valued in excess of $120,000, in the truck’s bed. The subject was transported to a local area hospital for minor injuries sustained in the collision. He was treated and released to Border Patrol custody. Agents transported all vehicles and marijuana to the Douglas Station for processing in accordance with Tucson Sector guidelines.